^ "Daten und Fakten zur Hauptstadtregion". 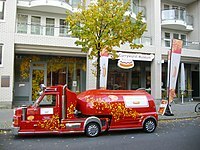 www.berlin-brandenburg.de. 4 October 2016. Retrieved 2019-02-23. ^ "Berlin, Germany Köppen Climate Classification (Weatherbase)". Weatherbase. Retrieved 2019-01-30. ^ Elkins, Dorothy; Elkins, T. H.; Hofmeister, B. (2005-08-04). Berlin: The Spatial Structure of a Divided City. Routledge. ISBN 9781135835057. ^ Alex (2015-05-10). "Climates classification by Wincenty Okołowicz". Vivid Maps. Retrieved 2019-03-10. ^ "Ramadan in Flüchtlingsheimen und Schulen in Berlin". Der Tagesspiegel. Retrieved 2019-02-23. ^ (Destatis),, Statistisches Bundesamt (2018-11-13). "Federal Statistical Office Germany – GENESIS-Online". 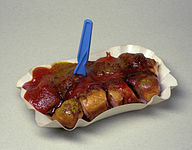 www-genesis.destatis.de. Retrieved 2018-11-13. 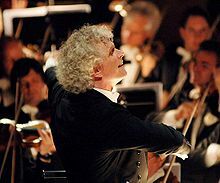 ^ "Unesco Creative Cities Network". projektzukunft.berlin.de (in German). Retrieved 2018-10-03. ^ Vogel, Carol (2000-12-21). 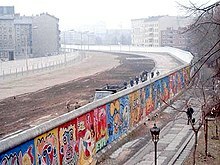 "Dealer Will Enrich Art of the Berlin He Fled". The New York Times. ISSN 0362-4331. Retrieved 2018-12-28. The Brandenburg Gate is an 18th-century neoclassical monument in Berlin, built on the orders of Prussian king Frederick William II after the (temporarily) successful restoration of order during the early Batavian Revolution. One of the best-known landmarks of Germany, it was built on the site of a former city gate that marked the start of the road from Berlin to the town of Brandenburg an der Havel, which used to be capital of the Margraviate of Brandenburg. The Straße des 17. Juni, is a street in central Berlin, the capital of Germany. 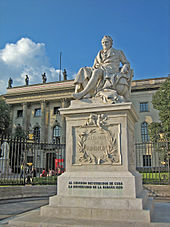 It is the western continuation of the boulevard Unter den Linden. 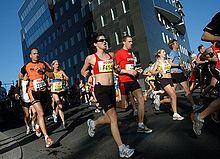 It runs east–west through the Tiergarten, a large park to the west of the city centre. At the eastern end of the street is the Brandenburg Gate, it then passes the Soviet War Memorial before passing either side of Victory Column (Siegessäule) in the middle of the park, and out of the park through the Charlottenburg Gate, terminating about half a kilometre later at Ernst-Reuter-Platz. 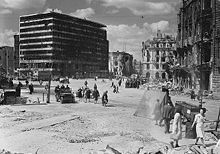 The street is a section of the main western thoroughfare radiating out from the centre of Berlin so the road continues to the west of Ernst-Reuter-Platz, the first section of which is called Bismarckstraße. The history of Berlin starts with its foundation in the 13th century. 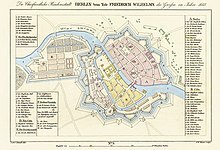 It became the capital of the Margraviate of Brandenburg in 1417, and later of Brandenburg-Prussia, and the Kingdom of Prussia. Prussia grew rapidly in the 18th and 19th century, and formed the basis of the German Empire in 1871. After 1900 Berlin became a major world city, known for its leadership roles in science, the humanities, music, museums, higher education, government, diplomacy and military affairs. It also had a role in manufacturing and finance. During World War II, it was virtually destroyed by bombing, artillery, and ferocious street-by-street fighting. It was split between the victors, and lost its world leadership roles. 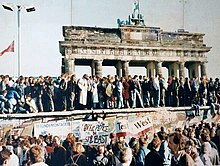 With the reunification of Germany in 1990, Berlin was restored as a capital and as a major world city. 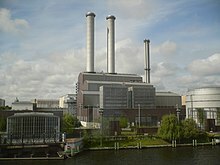 Spandau is the westernmost of the twelve boroughs (Bezirke) of Berlin, situated at the confluence of the Havel and Spree rivers and extending along the western bank of Havel. It is the smallest borough by population, but the fourth largest by land area. Kreuzberg, a part of the combined Friedrichshain-Kreuzberg borough located south of Mitte since 2001, is an area of Berlin, Germany. Kreuzberg is often described as consisting of two distinctive parts: the SO 36, home to many immigrants; and SW 61, roughly coterminous with the old postal codes for the two areas in West Berlin. Kreuzberg has emerged from its history as one of the poorest quarters in Berlin in the late 1970s, during which it was an isolated section of West Berlin to one of Berlin's cultural centers in the middle of the now reunified city, known around the world for its alternative scene and counterculture. Charlottenburg is an affluent locality of Berlin within the borough of Charlottenburg-Wilmersdorf. Established as a town in 1705 and named after late Sophia Charlotte of Hanover, Queen consort of Prussia, it is best known for Charlottenburg Palace, the largest surviving royal palace in Berlin, and the adjacent museums. Köpenick is a historic town and locality (Ortsteil) that is situated at the confluence of the rivers Dahme and Spree in the south-east of the German capital city of Berlin. It was formerly known as Copanic and then Cöpenick, only officially adopting the current spelling in 1931. It is known for the famous imposter Hauptmann von Köpenick. Karl-Liebknecht-Straße is a major street in the central Mitte district of the German capital Berlin. It is named after Karl Liebknecht (1871–1919), one of the founders of the Communist Party of Germany. The street connects the Unter den Linden boulevard with the Prenzlauer Allee arterial road leading to the northern city limits. Although part of the street dates back to medieval times, most of the buildings at its side were built in the 1960s, when East Berlin's centre was redesigned as the capital of East Germany. After 1870 Berlin became one of the largest and most advanced industrial centers in Europe. 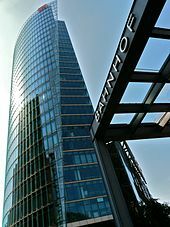 A number of major German companies were founded in Berlin, such as Siemens, Deutsche Bank, Lufthansa, Allianz, AEG, Telefunken, Osram, Knorr-Bremse and Edeka. 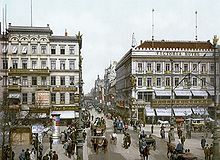 After 1900 the Berlin banking district became a major continental financial center and was home to a number of prominent banks. Berlin has developed a highly complex transportation infrastructure providing very diverse modes of urban mobility. 979 bridges cross 197 kilometers of innercity waterways, 5,334 kilometres (3,314 mi) of roads run through Berlin, of which 73 kilometres (45 mi) are motorways. In December 2015, the city-state of Berlin had a population of 3,520,031 registered inhabitants in an area of 891.82 square kilometers (344.33 sq mi). The city's population density was 3,944 inhabitants per km². Berlin is Germany's largest city and the second most populous city proper in the European Union. Rahnsdorf is a locality (Ortsteil) of Berlin, Germany, located in the southeast of the Berlin borough (Bezirk) of Treptow-Köpenick. 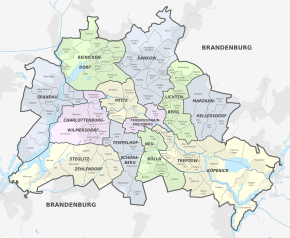 Until 2001 it was part of the former borough of Köpenick. Dorotheenstadt (help·info) is a historic zone or neighbourhood (Stadtviertel) of central Berlin, Germany, which forms part of the locality (Ortsteil) of Mitte within the borough (Bezirk) also called Mitte. It contains several famous Berlin landmarks: the Brandenburg Gate, the Pariser Platz, and Unter den Linden. 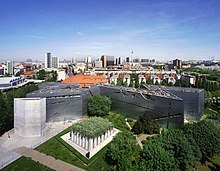 Berlin is recognized as a world city of culture and creative industries. 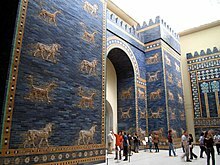 Numerous cultural institutions, many of which enjoy international reputation are representing the diverse heritage of the city. Many young people, cultural entrepreneurs and international artists continue to settle in the city. Berlin has established itself as a popular entertainment center in Europe. Berlin is a city-state and the capital of the Federal Republic of Germany. 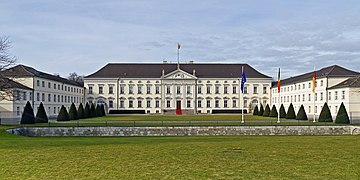 The President of Germany, whose functions are primarily ceremonial under the German constitution, has his official residence in Schloss Bellevue. Berlin is the seat of the German executive, housed in the Chancellery. Facing the Chancellery is the Bundestag, the German Parliament, housed in the renovated Reichstag building since the government's move to Berlin in 1998. The Bundesrat represents the Federal States (Bundesländer) of Germany and has its seat at the former Prussian House of Lords. Berlin is the capital city of Germany and one of the 16 states of Germany. 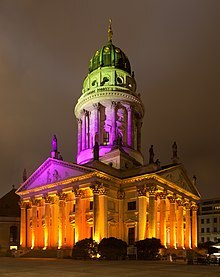 With a population of 3.4 million people, Berlin is the second most populous city proper, the seventh most populous urban area in the European Union, and the largest German city. Berlin's history has left the city with an eclectic assortment of architecture. The city's appearance in the 21st century has been shaped by the key role the city played in Germany's 20th-century history. Each of the governments based in Berlin—the Kingdom of Prussia, the 1871 German Empire, the Weimar Republic, Nazi Germany, East Germany and the reunified Federal Republic of Germany—initiated ambitious construction programs, with each adding its distinct flavour to the city's architecture.